Two examples of Bachmann's Chessie System plug-door are seen above. The second example features Bachmann's modernized tooling for this car. Bachmann's catalogs included this car, with white lettering and a black and white CP multi-mark logo, and it was not exclusive to the Canadian market. The above example features Bachmann's modernized tooling for the 50ft. Plug-Door. There are many variations to Bachmann's The Rock 50ft. Plug-Door, including examples with the original roofwalk style tooling and different paint applications. There may be an interesting story behind this car, but I don't know it. This appears to be a TYCO Santa Fe box car in a Bachmann box. At first, you would assume it is a simple case of box and car being mismatched. Bachmann does however display this same TYCO car in its late '70s product catalogs. I have also examined a number of examples and it does appear to be a TYCO produced car sold by Bachmann. The car carries the TYCO name on the underframe. Bachmann also sold TYCO's 40' Skid Flat with Culvert Pipes for a short time. Again, there may be a good story on it, but I have no further information. Bachmann's Santa Fe 51' Plug-Door Box Car may exist in at least two different paint schemes. The catalog entry in the rolling stock section generally displays a red car with a large black and white Santa Fe herald on the car's right side. The Shock Control lettering is placed on the left side of the car above the ATSF reporting marks. Bachmann's catalogs also present a Santa Fe example in train set offerings that is different. This train set pictured car is similarly lettered to the well-knwon TYCO example and includes the small square Santa Fe herald on the car's left side and the El Capitan information on the right side. 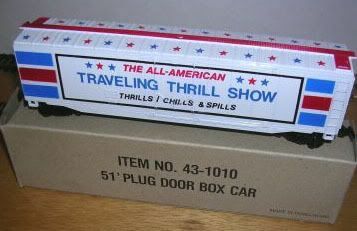 Included in Bachmann's early 1980s Thrill Show train set offering. This red Bachmann 50ft. Plug-Door decorated for Triangle Pacific has some variations to its offerings. The car was frequently included in some of Bachmann's infamous train sets of the late '80s/early '90s when the company was making some very, very simplified paint applications. Those examples feature less printing and white only lettering. 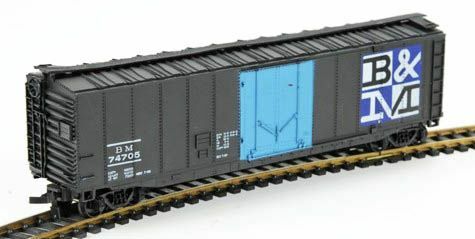 One of seven new body styles added to the HO-scale rolling stock line by Bachmann in 1972 is the 51' Steel Plug-Door Box Car. The car lists for $3.00 in '72 and is initially listed with six roadnames: B&M, C&O, CP Rail, IC, PC, and Santa Fe. An N-guage Pennsy example is shown in the catalog to represent this car in 1972, though Pennsyvlania is not among the roadnames listed for the car.